Most farmers have already started harvesting this season’s maize. Usually the first lands to be harvested are those that were planted first, or those that experienced stress sometime during the season. Lands that experienced stress are usually the first to show any signs of lodging. Healthy maize plants that received enough nutrients throughout the season usually do not lodge. The maize plant needs sufficient carbohydrates produced through the process of photosynthesis to fill the root and main stem cells to keep it alive and healthy. It also needs to store enough carbohydrates for the high energy demand during the grain filling stage. When maize experiences any stress during the grain filling stage, photosynthesis is reduced or even temporarily stops. This reduces the carbohydrates meant for grain filling. The maize plant reacts to this deficiency by extracting stored carbohydrates from the leaves, stems and roots and channels it to the developing kernels. This ‘self-destructive’ process ensures that carbohydrates reach the developing cobs on the plant to the detriment of the stem and roots, which in turn leads to the early death of the stem and roots. This early death of the cells may create the conditions conducive to a fungal infection in the stem and roots of the plant. The first symptom of this is usually only observed when the plant is almost physiologically mature and the lower leaves start to deteriorate. They generally turn yellow as a result of dying off. The loss or reduction of leaf surface due to leaf disease (Northern Corn Leaf Blight), insect damage, sunburn or hail damage. Any damage to the roots caused by insects or chemicals. Imbalances in nutrients, especially high Nitrogen in relation to Potassium levels. Soil compaction which can limit root growth. A plant population too high for the cultivar or potential of the soil. Most cultivars do not show any signs of stem or root rot right up until just before physiological maturity. It is usually difficult to differentiate between the different fungi responsible for which infection, as a complex of fungi are usually present. In addition, stalk borer damage as well as late autumn rain as experienced during this past season can also intensify the symptoms and rate of infection. The presence of stem rot, however, does not always cause maize to lodge. It can be avoided by harvesting the infected lands early. Many maize hybrids have very strong stalk walls which contributes to its ability to stay standing even though the core of the stem is destroyed. 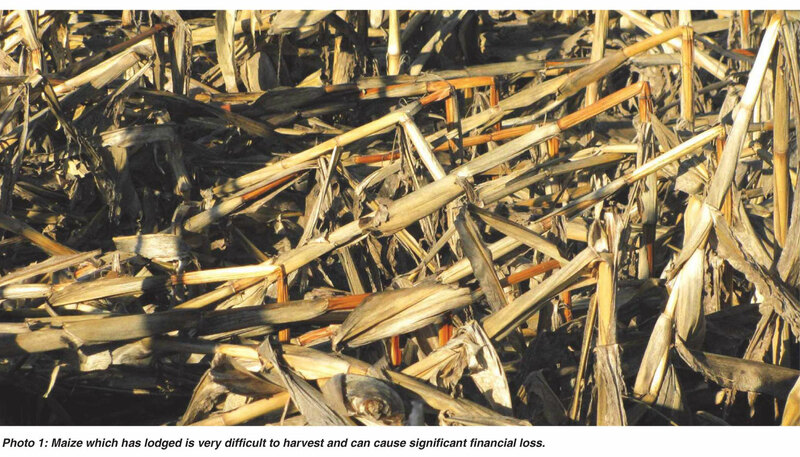 Lodging of maize can however still be avoided, especially in cases where the maize was harvested late or where the plants have been exposed to winter rains and/or strong winds. Through good land inspections, a problem land could be harvested early and potential damage avoided. Damage to the core of the stem is a symptom of all types of stem rot. It can easily be tested for by flattening the internode between your thumb and forefinger. The plant can also be tested by taking hold of the cob and pressing it approximately 15 cm to 25 cm towards the next row. If the plant bends/breaks between the head and the roots, then stem and root rot is most likely present. To avoid losses due to maize plants falling over, it is important to identify the infected lands as soon as possible for them to be harvested first. The lands which have experienced drought during the season or those that are infected with Northern Corn Leaf Blight should be the first to be inspected and harvested. Article submitted by Nico Barnard, Agronomist, PANNAR SEED (PTY) LTD, South Africa. For more information contact Nico at 082 850 1503.